Danish wind farm company could change game in N.E. Over three decades, DONG has built one-third of the world’s offshore wind-energy capacity. Above, its Avedore power plant in Copenhagen. Six months ago, few New Englanders had heard of DONG Energy. But that is likely to change soon as the Danish company with a quirky acronym for a name pursues its plans to build a massive offshore wind farm south of Martha’s Vineyard. The roughly $10 billion-a-year behemoth is already a major player in the European energy market, with deep pockets and a nearly 25-year track record of building turbines in the ocean, making it the global leader in the offshore wind business. That history will prove helpful as DONG eyes a North American expansion from its new office in Boston’s Financial District. The company’s expertise and its ability to dedicate more than $1 billion a year to offshore projectscould give it a significant edge over two other wind developers that also have rights for federal waters south of New England. The Danish government-owned company got its start managing fossil-fuel projects in the North Sea four decades ago. Its name, translated, stands for Danish Oil and Natural Gas, a reference to those early ventures. The energy company is proposing what could be North America’s largest offshore wind farm 15 miles south of the Vineyard. In 2006, several Danish energy companies were merged into one company under the DONG umbrella. Among them was Elsam, which built the world’s first large-scale offshore wind farm, known as Horns Rev 1, several years earlier, as well as the first one ever, back in 1991. 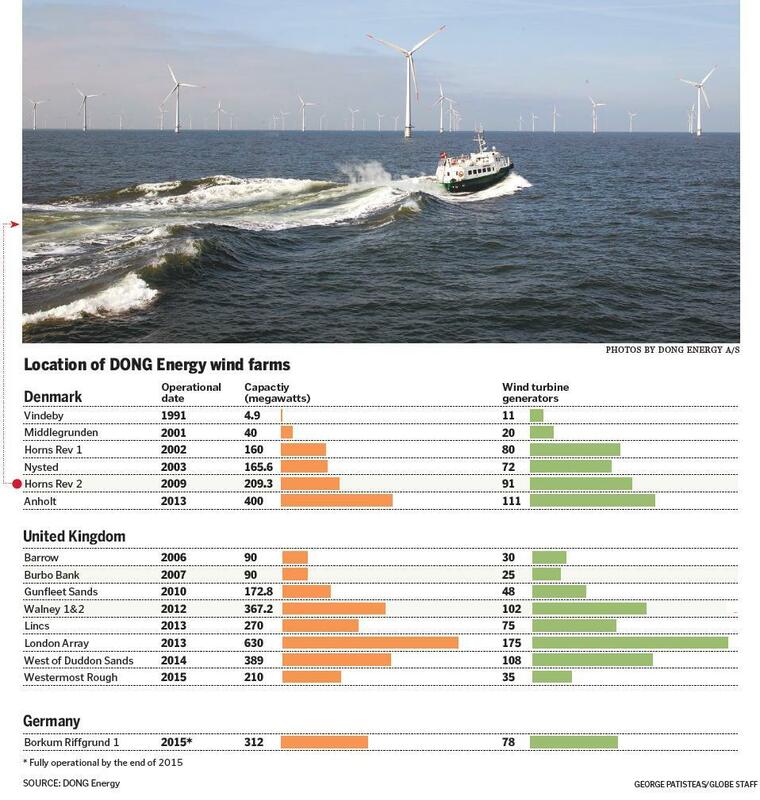 DONG’s ventures benefited significantly from government incentives for clean energy across Europe, some of them created specifically for offshore wind. The Danish government, for example, has a target of ensuring that all of the country’s electricity can come from renewable sources by 2050. By 2014, wind energy represented nearly 15 percent of DONG’s revenue and nearly 40 percent of operating profit. The offshore wind division is now the biggest in the world, with about 2,000 people and 14 offshore wind farms. But amid expansion, controversy swirled. In an effort to help finance the offshore wind expansion and stabilize its finances, DONG accepted a $1.5 billion investment early last year from Goldman Sachs. 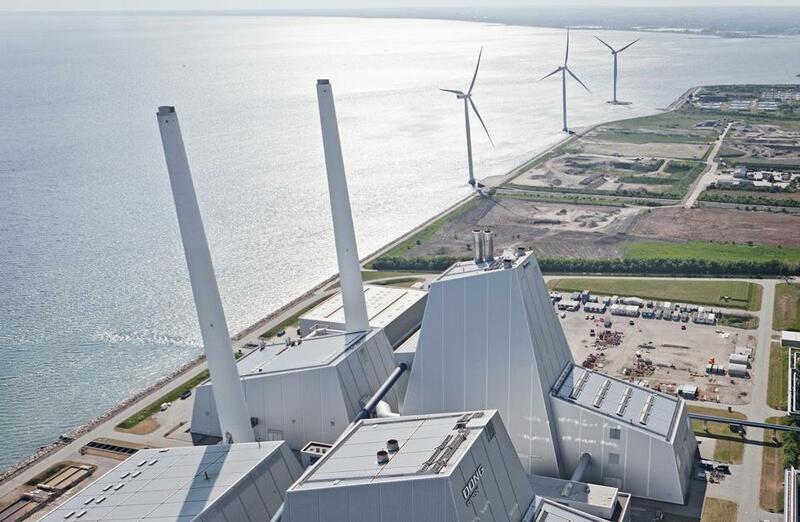 The New York bank’s involvement sparked furor from the Danish public, with many residents upset because an international investment bank would play a major role in a Danish utility. By this past spring, DONG executives had started to cast their sights across the Atlantic, seeing untapped opportunity in the relatively shallow waters and powerful breezes off New England’s coastline. Samuel Leupold, the head of DONG’s wind operations, said the company recognized that the offshore wind industry was starting to develop in the United States. It made sense, if just for competitive reasons, for it to figure out a way into this nascent market. The Danish executives entered the US market relatively quietly in April with a deal to acquire development rights for 187,500 acres 15 miles south of Martha’s Vineyard — enough room, DONG says, for 100-plus turbines that could collectively generate enough electricity to power up to 500,000 homes. The local operation would be called Bay State Wind. Wind industry supporters see what DONG accomplished in places like the United Kingdom, where its workforce grew from 10 in 2009 to 725 today, and hope that success can be replicated in the United States. “They can bring that kind of get-it-done philosophy, that capability to the states,” said Greg Cunningham, the Conservation Law Foundation’s clean energy director. But there is competition in New England from two other companies. OffshoreMW is owned by the private equity giant Blackstone Group, but its affiliates have built just one 80-turbine, offshore in Germany. The second group, Deepwater Wind, is backed by the investment firm D.E. Shaw. Its experience is limited to a five-turbine project off Block Island, R.I., that will be done in 2016. By comparison, DONG’s broad portfolio means it has a proven recipe for wind-farm development — honed over three decades of building one-third of the world’s offshore wind capacity — that gives it an edge. 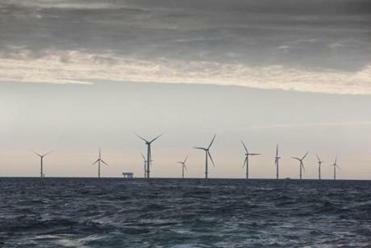 The company has also committed to setting aside more than 60 percent of its capital investments for offshore wind-specific projects, according to a spokeswoman, providing serious financial muscle for the division. “They will have some advantages with some of their expertise, their balance sheet, and financing depths,” said Peter Rothstein, president of NECEC, a renewable-energy trade group in Boston. For the project to move forward, though, it will also need legal cover in the form of new state legislation that would allow big utilities to enter into long-term contracts for offshore wind farms, thereby guaranteeing them a sustained customer base. With that in mind, DONG is working to build relationships on Beacon Hill. At the company’s invitation, Representative Patricia Haddad, a Somerset Democrat who is the industry’s most prominent supporter in the State House, along with several colleagues, traveled to Denmark in September, in part for a tour of a DONG wind farm. The Danish company also will need to escape Cape Wind’s long shadow. For years, that project was New England’s only offshore wind proposal. But Cape Wind stalled amid court challenges and eventually lost contracts needed for financing. Developer Jim Gordon hasn’t given up hope, but his prolonged quest to build in Nantucket Sound has made some skeptical about offshore wind here. DONG doesn’t have specific wind farm plans drawn up yet for New England. But it has several advantages over Cape Wind. Its new farm would be built in stages and would be much farther from shore, in areas designated for wind farm construction, limiting the potential opposition. It would also use much bigger, more modern turbines, allowing it to generate more power — and more revenue — per windmill. Despite the competition from the Danish company, the two other wind farm developers say they are not threatened. But right now, there’s power in numbers. All three want to convince politicians and the public that they’ll be more effective than Cape Wind. DONG’s long list of successful offshore wind farms brings credibility to an industry that’s still in incubation mode in the United States. “It gives us a lot of confidence that we made the right decision in acquiring our lease area to know the world’s largest offshore wind developer is right next door,” said Erich Stephens, an executive vice president at OffshoreMW.